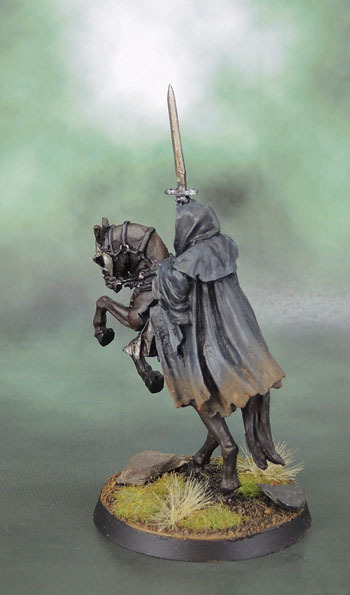 The Black Rider – Citadel Miniatures Mounted Witch King of Angmar | Azazel's Bitz Box. 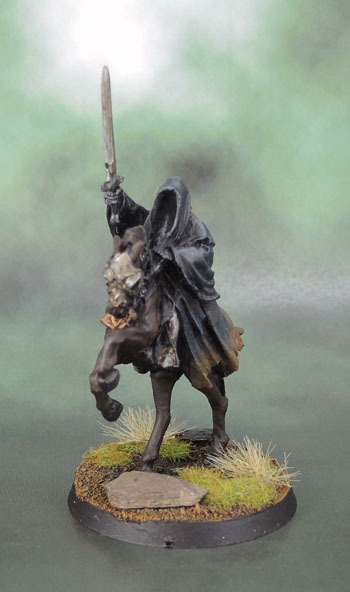 This entry was posted in Kings of War, Lord of the Rings, Mordor, Undead Army, Vampire Counts and tagged Black Riders, Citadel Nazgul, Dark Riders, Lord of the Rings, LotR SBG, Nazgûl, Strategy Battle Game, War of the Ring, Witch King of Angmar. Bookmark the permalink. Brilliant mate. 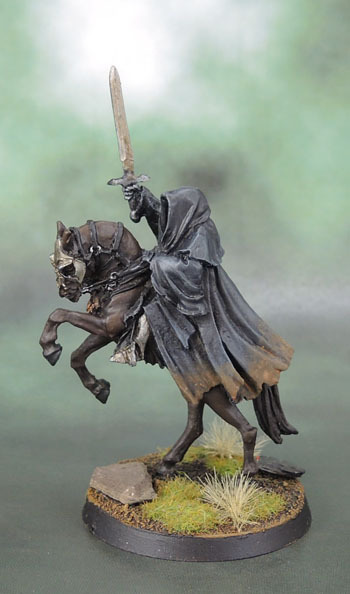 I really like the model and you’ve done it justice with your skills as a painter. The weathering looks perfect. Not too much or too little. Thanks IRO. I’m looking forward to the weather getting better so I can get some terrain done with some nice appropriate weathering as well. I’ll have to try these weathering powders one of these days…. They’re worth the play. When I first decided to try using them I bought alcohol and all the rest to use as fixative, which looks nice, but has issues with the powders becoming far less visible, and not great either for models that need to be handled. 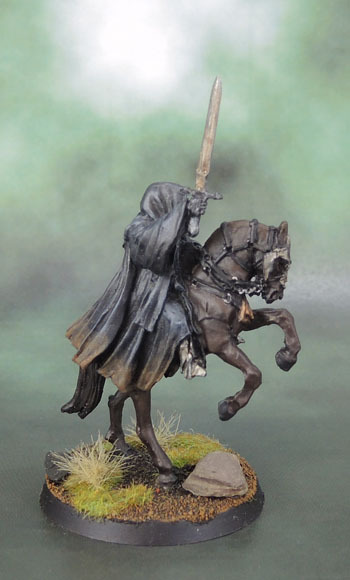 It wasn’t for a long time until I worked out to simply mix them with some matte varnish and a small bit of (distilled water/lahmium medium/whatever you use to thin your paint) and then basically paint it on, just being sure to have it thinner/feathered where it meets the area that you want non-powdered. Also, grab some “Dry Pigments” from the local Art Supplies – especially your brown/dark grey/blacks since it’s the same stuff anyway, only cheaper and for more product! Thanks for the tips; I will give it a go! Very nice indeed mate, good call on the brown for the horse! It’s subtle, but really does a good job in showing the rider off to best effect. 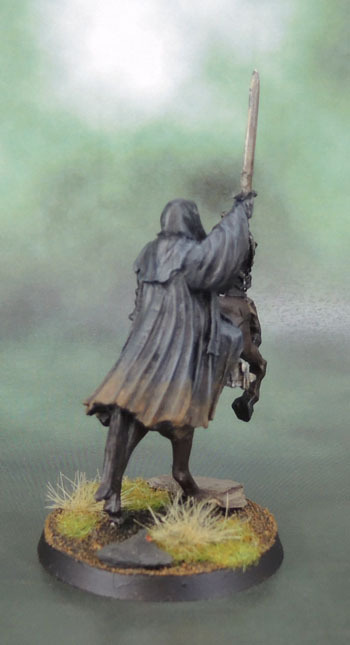 Love the black robes, and the use of weathering powder is spot on. Superb! I’ve been toying with the idea of using weathering powders. Which brand did you use? Are they similar to Vallejo pigments? Thanks Mark. The ones I used were either the Kromlech ones, the Vallejo Pigments or some I got from a local Art Supplies – Gamblin Burnt Umber – (which it turns out is the best way to buy a lot of the colours, as you get a TON more for a fraction of the price. They call them “Dry Pigments”, but same stuff basically. Thanks. 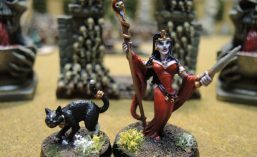 I just bought a couple Vallejo sets of 4 (soot and dust & stone and cement I think) that I got to use on some 3D printed ruined buildings. I looked at some YouTube videos and hopefully I can use and fix without an airbrush (don’t have one). Your work gives me some hope on that front! I’m assuming you varnished before applying the pigments? Those Vallejo sets will probably have enough to have you going for awhile unless there’s a key colour you’d also like to get. I think I have both of those sets myself from when I bought my first ones. I do my (final) varnish before pigments, and all my stuff is brush-applied as well. I worked out to simply mix them with some matte varnish and a small bit of (distilled water/lahmium medium/whatever you use to thin your paint) and then basically paint it on, just being sure to have it thinner/feathered where it meets the area that you want non-powdered. Both posts are still mangled right now because Photobucket, and I’m about to head out for a few hours, but I’ll repair them both once I get home – so give me 12 hours to be safe! Gorgeous paintjob on a gorgeous mini, well done sir. Thank you mate. Maybe I can motivate myself to finish the rest of the “plain” riders now? Definitely sounds like a plan to me! I’d recommend just keeping an eye out on eBay, pretty much everything will turn up there sooner or later. I also understand that there are some great B/S/S groups on facebook, though I’ve got no experience with them personally. Yep that’s pretty much what I’ve been doing problems with eBay scalpers and with Facebook not really done it and hit and miss who gets her first. 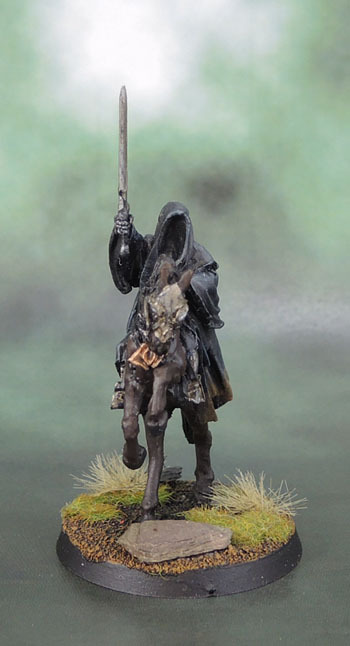 I think the mud effect on his cloak worked out very well and adding some accent colour to the horse also paid off.